During his second internment, Adams tried to escape twice – on Christmas Eve, December 1973 and again in July 1974. THE UK SUPREME Court has granted Gerry Adams permission to appeal his convictions for two escapes from Maze prison, also known as Long Kesh, in the 1970s. 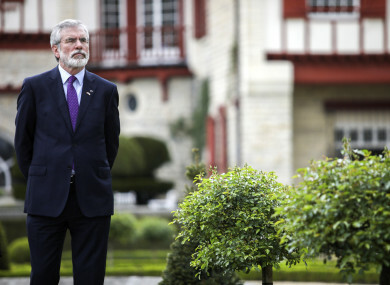 Adams, now 70 years old, had been imprisoned under the policy of internment, which was introduced by the Northern Irish government in 1971, and remained in force until 1975. It saw 1,800 Irish Republicans and 107 loyalists arrested and imprisoned without trial. During his second internment, Adams tried to escape twice – on Christmas Eve, December 1973 and again in July 1974. He was convicted of attempting to escape from lawful custody and sentenced to 18 months in prison. The former Sinn Féin president had argued in the Northern Ireland Court of Appeal earlier this year that his internment wasn’t legal, as the order for his arrest wasn’t signed by the Northern Ireland Secretary of State, but by lower officials. He discovered this following the release of State Papers in the UK under the 30-year rule. Adams says that because his custody order and thus internment were not lawful, then his attempts to escape should not have been prosecuted. The Court of Appeal rejected his case that the order was invalidated because it wasn’t signed by the Secretary of State, himself, in February 2018. However, on 31 October, the Supreme Court in the UK granted permission to appeal the ruling. It will have to reexamine if the interim custody order (ICO) made under the Detention of Terrorists (NI) Order 1972 against him in 1973 was valid. Email “UK Supreme Court will hear Gerry Adams' case to overturn prison escape convictions”. Feedback on “UK Supreme Court will hear Gerry Adams' case to overturn prison escape convictions”.